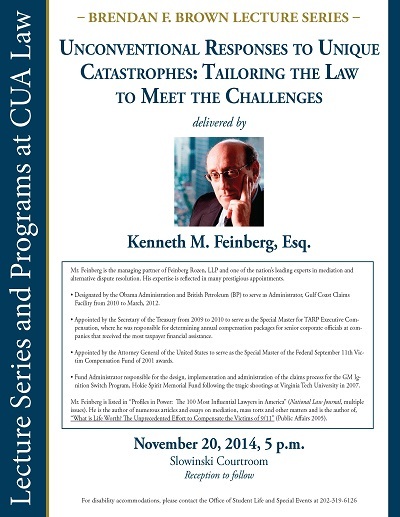 "Unconventional Responses to Unique Catastrophes: Tailoring the Law to " by Kenneth M. Feinberg Esq. Kenneth Feinberg—arguably the country’s best-known Special Settlement Master, mediator and arbitrator—delivered the law school’s second Brendan F. Brown lecture of the semester during which he discussed his work and what he has learned about human nature over many years in such roles. Time and again, he has been tapped by the government to settle claims and cut the checks to victims and families in the wake of such seminal events as the BP Oil Spill, the GM Ignition Switch Program, the Hokie Spirit Memorial Fund following the tragic shootings at Virginia Tech University, and the granddaddy of them all, the distribution of the 9/11 victims fund. Feinberg, Kenneth M. Esq., "Unconventional Responses to Unique Catastrophes: Tailoring the Law to Meet the Challenges" (2014). 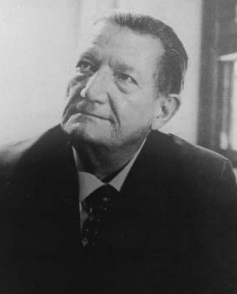 Brendan F. Brown Lecture Series. 18.